I generally prefer not to use ingredients just for the sake of it, I like to know that they are adding something to the properties of the finished soap. As you know, I don't like to use artificial ingredients either (colours or fragrances). When I read about beer in soap I found out that beer adds sugar to the mixture, which increases lather. I use tallow in my soap, which has limited lather, so anything that adds lather could improve the soap. It also contributes a tan or brown colour to the soap depending on the beer and the concentration. For this soap I used Coopers stout, which is a rich dark beer. Before making soap, the beer must have no bubbles left, so you can either leave it in an open vessel for a few hours or boil it and let it cool - this also increases the concentration of sugars and colour. I chose to boil the stout for about an hour, which reduced it to around half the original volume. I didn't add any fragrance to this soap as I wanted to try using oil infused with hops. I had some hops in the fridge from our beer-making hobby (I also had some toasted barley, which I used on top of the soap). I infused the hops in olive oil using the waterbath method, and the oil smelt very hoppy before making the soap, however the fragrance did not transfer to the finished soap, or only a very subtle whiff anyway. It mostly just smells faintly like scorched beer. To use the beer in the soap, you replace the water in the lye solution with beer. As the caustic soda dissolves in the beer, the sugars scorch, which causes the smell. Next time I will use an essential oil to cover this (the same thing happens with my coffee soap). This is the recipe I used, but you can just substitute beer for water in your favourite soap recipe if you want to use different oils. 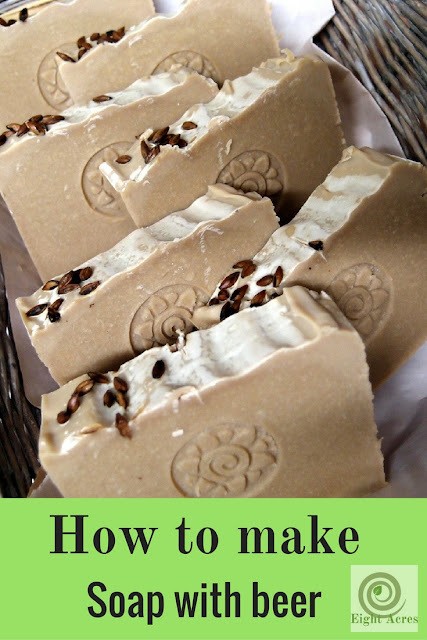 Follow instructions in this post or wait for my tallow soap ebook coming VERY soon.... it includes information about working with tallow and a beginners guide to making soap at home, plus 10 tallow soap recipes with step by step instructions. The results of this experiment were interesting. I love the colour. As I said above, the hops smell didn't really come out in the soap. The lather is no different from plain tallow soap I think. I'm not sure if its worth the effort of preparing the beer, but it is a nice gimmick for a gift, particularly for men (although some may prefer to have the beer separately). What do you think? Have you tried making soap with beer or other weird ingredients? I love all of your soap concoctions Liz. 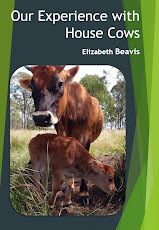 That reminds me, I must stock up on our soap and use up some of the tallow in my freezer. Amazing, first that I have heard of that recipe. I grow hops and really love the smell so the soap must be wonderful with a hint of hops. wow that soap looks deliciously edible! I just observe in awe Liz. I think I am in more awe of how you find the time to do all this stuff as much as anything! Liz it looks great. 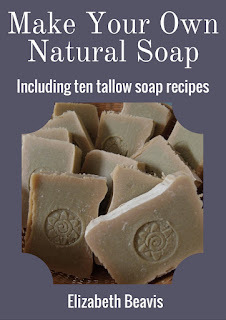 I can't wait to try tallow soap this year sometime. I had to share this with everyone! We're a big homebrewers so now we're even more excited to brew beer!